The column you were never meant to read: what if Collingwood won? From the editors: The West Coast Eagles won the 2018 AFL premiership yesterday – but what if they hadn’t? We asked Ryan Buckland to put together two columns. One for a West Coast victory, and one for Collingwood. Ryan’s column celebrating West Coast’s premiership victory yesterday was a ripping read – but we figure, why waste his good work? So today, if you dare, have a read of the column you were never meant to see: what if Collingwood won the 2018 grand final? And when I say Collingwood’s vision of itself, I of course mean Eddie McGuire’s vision of Collingwood. Hands up if you thought Collingwood were going to win a premiership this year? The next three years? Five? What a stunning rise, albeit from a team that has all the markings of a modern AFL premier. A team in the top four for both average age and average experience? Check. 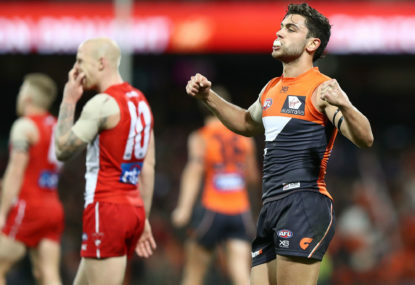 A top-four finisher, albeit one that surged all the way from 13th on the ladder last season? Check again. A team that has been active in the player exchange market after spending a year or two acquiring highly-rated youngsters to build around a previously successful core? That makes three. Really, we should’ve seen this coming. Some people did, and from a mile away. But collectively we didn’t think a premiership was possible this year because Collingwood’s output has not matched the inputs for half a decade. 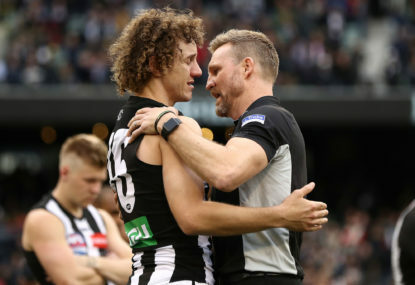 Forever and a day we were conditioned to believe it was all coach Nathan Buckley’s fault. I pondered whether that meant this was all really McGuire’s – club president and broker of Buckley’s rise to the position – fault. After all, it was apparently his vision to bridge from one successful era, the Michael Malthouse era, to another via the club’s favourite son in Buckley. This time a year ago Collingwood moving on from Buckley was a live option. 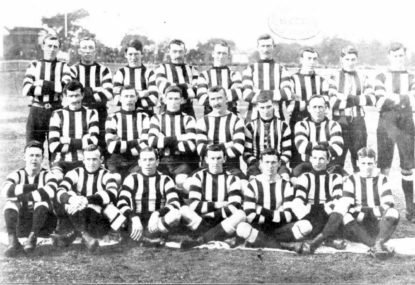 The Pies had sunk to that 13th spot on the ladder, having gone through their sixth successive campaign resulting in equal or fewer wins than the one before. 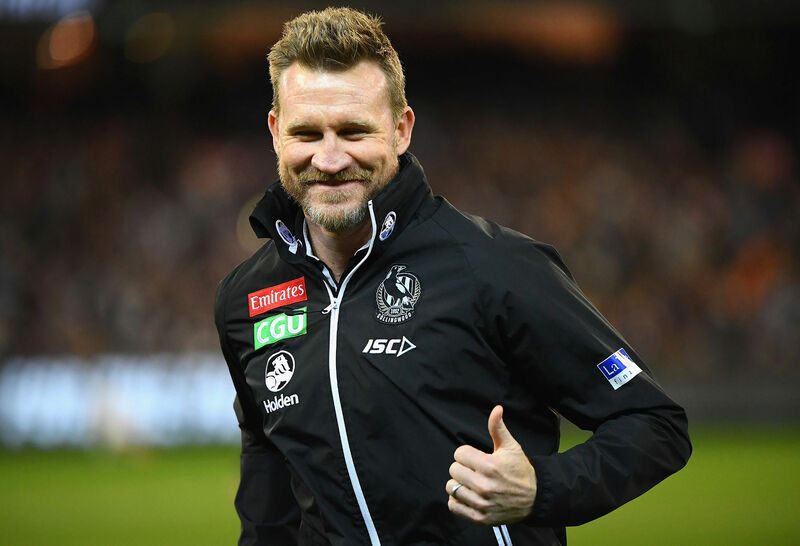 Football department boss Geoff Walsh, who had returned to Collingwood the year prior as the club’s fifth football department manager in four years, tabled a review at the club’s August board meeting that determined the club was trending up on an underlying basis. McGuire was bullish at the post-board press conference. “We have seen the way this list plays for Nathan. He is a man of the highest integrity, he has compassion for his players on and off the field, he is uncompromising in his commitment to the role and we believe he is taking this group in the right direction.” Everyone else was a little less sure. 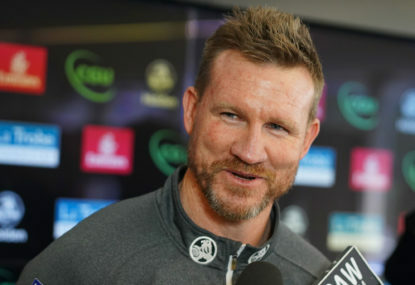 Buckley becomes the first and perhaps only of the 2000s-era favourite sons to go on to coach his team to a premiership. The other two, Brisbane’s Michael Voss and Essendon’s James Hird, were found wanting. But not Buckley. Collingwood’s coach has been known as a bit of a taskmaster. Judging him from afar it’s hard to come to any other conclusion. Yet in 2018 we’ve been told he mellowed out just a little. This seems to be a trend – coaches giving up some of the power that comes with the rigidity of an old-school football program, handing some agency to assistant coaches, and a new group of assistant coaches at that, and reaping the rewards. It is working wonders for Richmond coach Damien Hardwick, and from what we learnt about the environment at West Coast this year, it’s working for them too. The Demons had a miniature crisis at the start of the year centred on a coaching group that went a little too far in the minds of the players (though they obviously recovered from it); ditto the Crows (less so). We might be on to something here. The coach and the chairman and notions of destiny are important, but ultimately this premiership win is about the players. And aren’t there some stories to tell here. Mason Cox didn’t know what a real football was four years ago. Josh Thomas returned from a two-year performance-enhancing drugs suspension at the start of last season. Chris Mayne was going to be salary dumped back to Fremantle one year into a three-year contract until the AFL disallowed the trade. Jaidyn Stephenson slipped to Collingwood on account of a bung heart but won the rising star award and is now a premiership player. Tyson Goldsack tore his freaking ACL in March. Travis Varcoe’s sister passed away after an accidental clash in a football game. Adam Treloar tore both of his hamstrings within seconds of each other. Brody Mihocek was passed over in multiple drafts, was taken as a rookie this year, and hasn’t been out of the team since his debut. Jordan De Goey was banished by the club for the second time in as many years at the beginning of the season. Everywhere you look there’s an extraordinary story to tell. But there are yarns for days even for those who’ve had more ho-hum seasons. Where does captain Scott Pendlebury now sit in the Australian Rules football pantheon? He, Goldsack and Steele Sidebottom are now two-time premiership players, with the flags separated by almost a decade. Nine of Collingwood’s 22 started their careers at other clubs, the Pies using plenty of draft capital to poach them once they’d got some miles on their odometers. In a lot of ways Collingwood’s 2018 season is a triumph of circumstance. 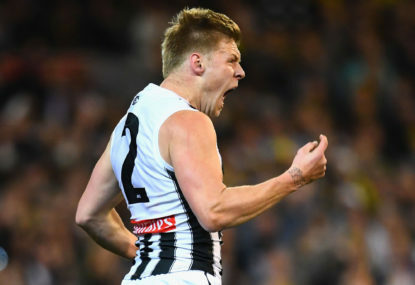 Coming into the year there’s no way we would have thought a forward line of Cox, De Goey, Mihocek, Thomas, Stephenson and Will Hoskin-Elliott would lift the premiership cup. Ditto a backline that has had zero continuity save for the last quarter of the season. The Pies have been wrecked by season-ending injuries to players we would have pencilled in as critical in March. Daniel Wells, Jamie Elliott, Matthew Scharenberg, Darcy Moore. Despite it all, Buckley and his team discovered winning combinations across the ground. 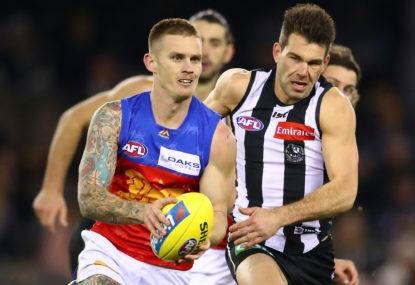 And with a ferocious commitment to the contest and sterling execution of a handball-heavy game plan, Collingwood has captured quite a stunning premiership. We might not have seen it coming, but in hindsight we absolutely should have. 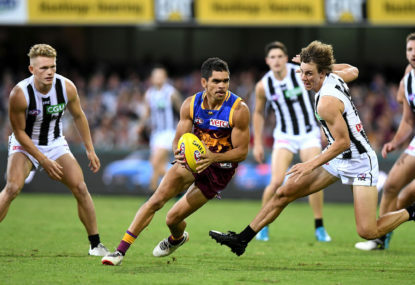 Can the Pies back up the most unlikely of premiership wins? It doesn’t matter now. Collingwood has returned to what it surely considers its rightful place in the pecking order.